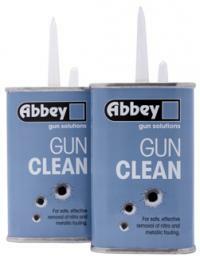 Abbey Gun Clean breaks down and removes all fouling from shotgun and rifle barrels. Its fine water dispersant qualities ensure that no rain or moisture remains to cause rusting and corrosion whilst in storage or at the next shoot. Rod through with a wad soaked in Gun Clean. Keep replacing soaked wadding until it comes clean and all residue is removed from the barrels. Give a final wipe with a soaked wad to leave a fine oil film for protection whilst in your gun cabinet. Include areas such as muzzles, ejectors and shutplate to bring your gun back to new factory condition. Light oiling of ejectors and the safety catch will have the gun ready for your next outing.